The Capital One Savor Cash Back rewards credit card is an ideal option for someone who wants to earn 4% cash back on everyday expenses like dining out, groceries, and entertainment. It also includes a lucrative $500 sign up bonus, $0 intro fee for the first year and no foreign transaction fee. However, if you don’t spend enough on these types of activities then you won’t get ahead much on the rewards due to the annual $95 fee. Once your account is approved you are eligible to earn a one time $500 sign up bonus once you spend at least $3,000 in your first three months. This can be used as a statement credit or cashed out in the form of rewards such as cash back, gift cards, etc. Any expense on dining out and entertainment will earn you 4% cash back. There is no maximum spending amount where the 4% stops accruing, it’s unlimited. You’ll also earn 2% back at grocery stores and 1% on all other purchases. The Capital One Cash Back rewards card has fixed cash back rates so you don’t have to worry about keeping track of rotating categories and activating them each quarter to accrue higher cash back rates on certain expenses. Also, your cash back rewards don’t expire so you can wait to use them as long as you’d like. As a card member, you get a beneficial perk of using Postmates Unlimited for free, which normally costs $9.99 per month. You’ll be billed the monthly fee by Postmates but Capital One will add the credit for it to your statement. Postmates is a food delivery service that allows you to order food online and they’ll bring it to you. This normally comes with a $1.99 to $3.99 food delivery fee for partner merchants or $5.99 to $9.99 for all other merchants. But these fees are waived for Postmates Unlimited members. One of the main drawbacks of the Capital One cash back card is it does have an annual fee. As an intro bonus, Capital one will waive the $95 fee for your first year but after that you’ll be billed annually for it. The downside of annual fees is they cancel out cash back rewards you earn with the card throughout the year. For example, someone who spends $20,000 on their credit card each year could earn between $200-$300 on cash back rewards which then gets reduced when you factor the $95 fee in. 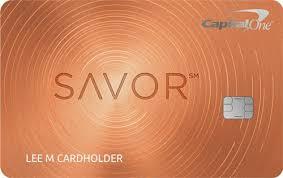 Capital One has some restrictions for getting approved for the Capital One Savor Card. You’re only allowed two capital one credit cards at a time so if you already have two you can’t apply for the third. Capital One also tends to restrict new card issues to every 6 months so if you opened a Capital One card previously in the past 6 months this could get your application denied. There are several other great options out there for cash back rewards credit cards that offer lucrative sign up bonuses, competitive cash back rates, and attractive intro APR periods. Let’s review a few of our top choices as alternative options to the Capital One Savor credit card.. The Chase Visa rewards card earns you 5% on different categories each quarter which can add up significantly throughout the entire year. Rewards categories rotate every quarter but can include expenses on gas, groceries, restaurants, wholesale clubs, and more. You can also earn a one time $150 bonus reward when you spend at least $500 in your first 3 months of opening the account. There is no annual fee and you get a 15 month 0% intro APR period on purchases and balance transfers. The Citi double cash rewards card is a no annual fee credit card that offers a flat rate 2% cash back on all purchases. You earn 1% on the purchase and then an additional 1% once you pay it off. It’s an ideal credit card if you plan to pay your balance each month and don’t want to worry about rotating rewards categories. For someone who spends $20,000 annually on the card, this can result in $400 roughly in cash back rewards. We like this card because it has no annual fee while offering a flat rate 1.5% cash back on all purchases. It also has a $150 sign up bonus when you spend at least $500 in your first 3 months which is an easy sign up bonus to meet the requirements for. You also get a 0% intro APR rate on purchases and balance transfers for 15 months. This give you time to pay down any previous balance you may be transferring over or pay off a new, large purchase slowly, interest-free during the intro period. Is the Capital One Savor Rewards Card Right for You? This credit card could be for you if you like lucrative $500 sign up bonuses and you like to spend money outside the home frequently on dining and entertainment. The 4% cash back applies to things like restaurants, fast-food places, coffee shops, cafés, lounges, bakeries, bars, nightclubs and more. It also applies to entertainment options like tickets at movie theatres, concerts, plays, theme park, aquarium, zoo, bowling alley, and more. However, if you don’t spend enough on these types of activities then you won’t get ahead much on the rewards due to the annual $95 fee. You could be better off finding an alternative card with no annual fee that offers 2% back on dining and entertainment.